Sometimes presentation is overrated. Eton Mess is a British dessert that’s an unapologetic mishmash of fruit, cream and crumbled meringues turned about and plunked in a glass or bowl. It’s the kind of mix that appeals to kids and adults alike. Its messy appearance belies its swoonworthy results with gently sweetened and ethereal whipped cream punctuated by juicy strawberries and crisp bits of sugary meringue. You can’t go wrong with this recipe which is a great way to highlight summer’s fresh berries. The only effort required is a little cream-whipping – and trying not to get too carried away with licking the spoon. For a little variation, I’ve added mascarpone to the whipped cream, which adds extra(!) richness and more body to the cream. Set aside 3 unblemished strawberries. Hull and quarter the remaining berries. Place in a bowl and sprinkle with 1 tablespoon sugar. Turn to coat then set aside. Whip the cream and mascarpone in bowl of electric mixer fitted with a whisk attachment until beginning to thicken. Add 2 tablespoons sugar and vanilla. Continue to beat until soft peaks form. Fold the quartered strawberries into the cream, then fold in the meringues with any fine sugary dust. Spoon into glasses or serving bowls. Cut reserved strawberries in half lengthwise and arrange on top of cream as garnish. I’m off to the local farm stand for fresh organic strawberries this afternoon and can’t wait to try a new recipe! A splendid spring dessert! Such a perfect seasonal treat – strawberries and cream, my favorite combo. I’ve always loved the name! What a perfect and pretty spring dessert. I love the word mess and it’s surely strawberry and mascarpone cheese time. 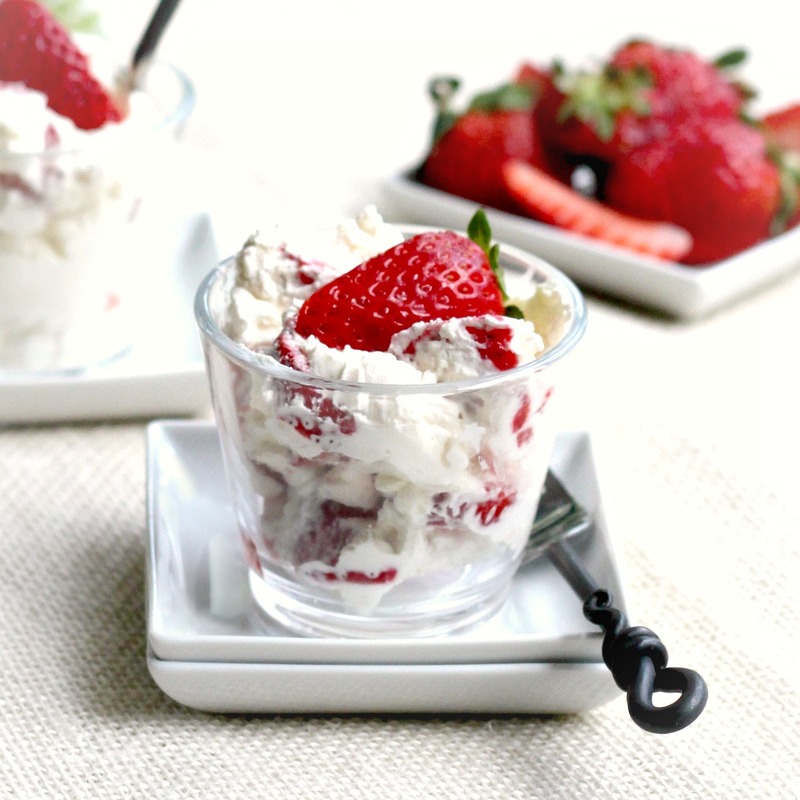 I love Eton Mess – such a perfect summer dessert. Yours looks gorgeous! I think this presentation is perfect. Looks delicious. I was never very good at plating, so a mess is right up my alley! Wow.. this is just spring in a cup! I’ve been wanting to make an eton mess for quite a while now! Love it! Lynda, this truly is my favorite dessert! Crunchy, creamy, sweet and oh so delicious…when strawberry season arrives it’s first on my list to make. I’m thinking of making a rhubarb mess soon. As always, your photo is incredibly lovely and tempting! Another wonderful post! I can’t wait for strawberry season. A mess of deliciousness! I love this dessert! !